This map throws you right into a gladiator pit. If you’re looking for a Call of Duty Zombies experience that has a variety of boss zombies, a new wonder weapon, and other unique features, IX might be the perfect map for you. IX is one of the new Zombies maps available in Call of Duty: Black Ops 4 at launch—and it’s a lot of fun. It might not be as difficult as Blood of the Dead, but IX definitely features its own set of unique challenges for zombie slayers to conquer. Once you’ve opened up the map and have a fully-loaded inventory, it’s not too tough to get to high rounds on IX. But how do you get to that point? Here’s what you’ll need to acquire or unlock to survive in IX. 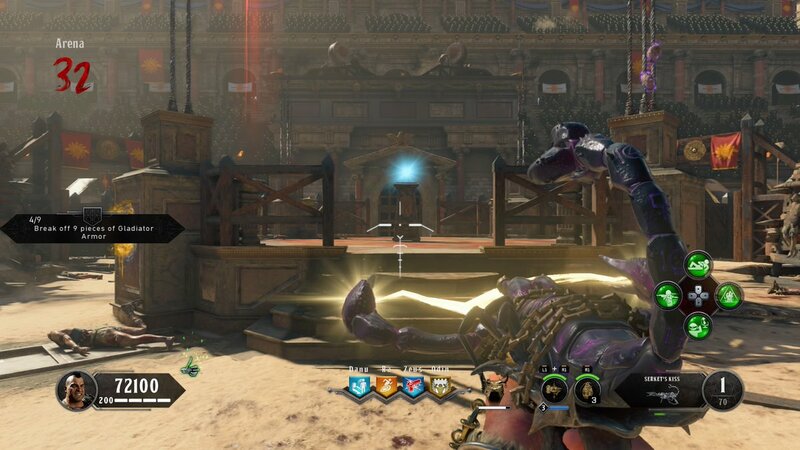 One aspect of IX that makes it a little easier than other Zombies maps is there’s a way to get a free Pack-a-Punched pistol in the early rounds. When you first spawn in, head out to the gladiator pit. There will be four banners along the circumference of the arena, one next to each of the four doors that can be opened. Simply go up to one of the banners and melee the rope to unlock a set of challenges. These challenges are relatively simple—you’ll be asked to get six equipment kills or knife 13 zombies, for example. After you complete a challenge, you just need to go to the altar and claim your prize to get another fresh task. Once you’ve completed three challenges, your prize will be a free Pack-a-Punched Strife pistol. This pistol can be extremely helpful in the early rounds because it gives you a strong weapon for free, allowing you to save up points to purchase another gun, perks, or open the many doors throughout IX. We strongly recommend going through this simple process as soon as you start each game of IX. The zombie shield is an integral item to build in almost every Zombies map—and that hasn’t changed on IX. There are three parts that you’ll need to locate in order to build this shield, which is called the Brazen Bull. The first part can be found in Odin’s Altar Room. It’ll either be on a wall to the left of the Odin perk machine, on a shield rack on the second floor, or in the left corner of the cauldron room. The second part is located in Zeus’ Altar Room. It can be found on one of the statues to the right of the Zeus perk machine, on another statue directly in front of you if you walk down the stairs to the second floor, or on top of a table on the third floor, Bath House. The third shield part is in Ra’s Altar Room, and it’ll always be on the top floor of this room. It’ll either be on the wall to the right of the perk machine or to the left or right of the window across from Ra. Once you have all three of these parts, simply head down to the bottom level of the map and you’ll find a workbench in the area called The Pit where you can build your shield. Equip the Brazen Bull by pressing L1 (on PlayStation 4). If you hit R2 with the shield out, you can use a little sword for a melee attack. And if you hold down L2 and then press R2, you’ll be able to shoot fiery bullets out of the shield. This shield is very helpful on IX and we definitely recommend building it as soon as possible in each game. If you’re a true fan of this game mode, you’ll know just how important it is to activate the Pack-a-Punch machine on any Zombies map. And luckily, it’s pretty easy to do so on IX. All you need to do is take down “champions” in each of the four Altar Rooms. There’s a gong located in each room. Simply go up to the gong and press Square to summon a champion, which will be some form of a boss zombie. After you kill these champions, a floating zombie head will appear with a blue light surrounding it. Simply pick up each head to add it to your inventory. Once you’ve defeated the champions in all four Altar Rooms and secured the floating zombie heads, head down to the bottom level of the map. Find the area called Temple. In the middle of the Temple, there will be four spikes sticking out of the ground. Press Square to “Feed the Altar” the zombie heads, and you’re done—the Pack-a-Punch machine will soon spawn in the middle of this room. It’s honestly very easy to get the Pack-a-Punch on this map. You’ll want to do this as soon as possible so you can upgrade your guns and prepare for the later rounds of the game. The wonder weapon in IX is called the Death of Orion, and it’s one of the coolest wonder weapons in Zombies’ history. But it’s definitely not the easiest gun to acquire. The first step toward unlocking this gun is to do the free challenges and acquire the Z-Harmony pistol. When you do this, there will be a large cauldron in the middle of the arena that you’ll need to pick up. Next, you’ll need to unlock the Pack-a-Punch machine. Once you’ve done this, you’ll need to pick up two parts in the Temple—a metal chain and a wooden cog, both located at the end of two tunnels in this area. Then, head out of the Temple into the Danu-Ra Temple Entrance and shoot a flaming cauldron. This will knock the cauldron off of its podium and cause a flaming arrow to burn on the ground below the bridge connecting the Ra and Danu Altar Rooms. This flaming arrow will be pointing toward one of the four Altar Rooms. You’ll need to go to that specific location and pick up a skull in a unique spot. Once you’ve found the skull, head to the tunnel connecting Ra’s Altar Room to the main arena. Build the Acid Trap and place the skull you found on the ground below the trap. Activate the Acid Trap and it’ll melt the skull to reveal a scorpion key for you to pick up. The next step is a little challenging and also requires a bit of luck. You’ll need to stay in the main arena for a few levels to kill zombies until you gain “Crowd Affinity,” which is tracked through the green thumbs-up symbol in the lower left corner of your screen. When you get Crowd Affinity, random power-ups will spawn in—but one time, the crowd will instead reward you with a small gold pot. You’ll need to pick up this pot and head down to the bottom of Danu’s Altar Room. Once you’re there, you’ll find a tree with a hole in it. Knife the hole or press Square to insert the scorpion key, and press Square below it to place the gold pot. When enough time has passed, return to this tree in Danu and pick up the gold pot, which should be filled with poison from the tree. Take it to the Mystery Box location, where you can hold Square to “poison the Mystery Box.” This will cause the next gun to come out of the Mystery Box to be the Death of Orion wonder weapon. The Death of Orion is incredibly powerful. You can tap R2 to shoot electric beams, or hold down R2 to charge up a larger blast. When upgraded with the Pack-a-Punch into the Serket’s Kiss, this gun is even more lethal—you can basically clear out entire hordes of zombies with one charged shot. You’ll definitely want to complete this lengthy process and acquire this wonder weapon if you hope to make it to the high rounds on IX. IX is a relatively easy map once you’ve completed the above tasks and have a fully-loaded inventory. You can easily train zombies in the center arena, and the four Altar Room entrances each provide you with escape routes if you get in any trouble. This map is incredibly fun, and we know you’ll enjoy it—especially if you get the chance to play with the Serket’s Kiss.